While I don’t believe the recent sell-off in the stock market is anything to be worried about, there are some stocks that will have a harder time recovering. An example of this is oil stocks. One way to tell when there is extreme bearishness in this industry is when it falls despite the steadiness of oil prices. Even though oil prices have remained in an uptrend, the stocks of actual oil companies have not. Compared to the overall market’s 6.8% drop from its January high, stocks in the SPDR S&P Oil & Gas Exploration & Production ETF (NYSE: XOP) have fallen 14.5% — more than twice as much. A few weeks ago, I wrote an article about how I believe oil prices are going to keep moving up. And I still believe that will happen; there’s been an overall shortage of oil in the U.S. for 10 of the past 11 weeks, and 24 of the past 31 weeks. That means that demand is higher than supply, which leads to a higher price in anything. Not to mention the raised oil consumption forecasts by OPEC and the EIA. But, for now, that doesn’t matter to oil stocks, as they continue to fall lower despite oil prices remaining steady. However, there’s a way to invest in XOP going down without all the complications of shorting it. 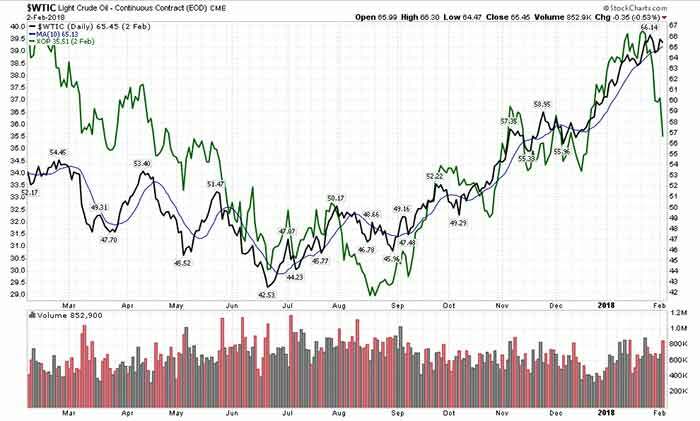 The Direxion Daily S&P Oil & Gas Exploration & Production Bear 3X ETF (NYSE: DRIP) will go up when oil stocks go down. But the “3X” in its name means that it’s leveraged, which means that it will move at a higher rate than the fund it’s based off of. So when XOP goes down 1%, the DRIP ETF will go up 3%. That means the returns are higher if XOP keeps moving down. But if XOP rebounds, losses in DRIP will be three times higher as well. While DRIP comes with more risk than a normal inverse ETF, it’s a good way to take advantage of the weakness in oil stocks. And, of course, any 3X leveraged ETF should be traded with its inherent risk in mind.